Get to know Nathan Freeman, the man drafted to Collingwood with selection No. 10 in the 2013 National Draft. 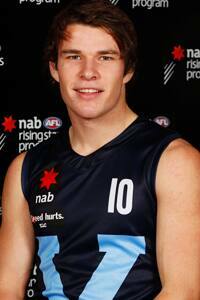 Get to know Nathan Freeman who has been drafted to Collingwood with selection No. 10 in the 2013 National Draft. With selection No. 10 Collingwood has drafted Sandringham Dragons midfielder Nathan Freeman. Profile: Another genuine clearance specialist with elite endurance and pace, Freeman tested impressively at the NAB AFL Draft Combine. The youngster from the Sandringham Dragons took out the repeat sprint event and came second in the 20m sprint testing, while also recording a top 10 result in the beep test and 3km time trial. An accomplished ball-user on the outside with an explosive change of direction, Freeman also has the ability to find his own ball with his strong build and ability to read the contest. He improved the defensive aspect of his game in 2013 and will be a tantalising prospect for any club looking for a line-breaking midfielder. Derek Hine Says: "Coming into the system he has shown extraordinary power inside and outside and he helps with our succession plans. He has really strong leadership attributes and is his own man." "There's not a lot of explosive speed in this draft, but Freeman has it. He likes to take off with a shake of his hips, and attack. His challenge this year was been to pick up his disposal efficiency, to handball a little more and to improve the defensive side of his game, and he's worked hard in all areas. He's strong, keeps his feet, plays like he loves it and is always looking to get involved," - Emma Quayle, The Age, 17 November. "Inside midfielder is exhilarating to watch, using his top-line speed to burst away from danger or cut apart stoppages, in the same vein as Patrick Dangerfield," - Sam Landsberger and Jay Clark, Herald Sun, 27 October. "Like Josh Kelly, he took the combine by storm not only with his testing but with his personality - he was up and about all week. His personality is a bit like the way he plays - it's up and about and sometimes a bit in your face, but in a good way, but I think he's exciting and we are going to be talking about him in the next few years at AFL level taking the game on and doing really well. He's got that electric burst of speed but has also worked very hard on his endurance and firmed right into a possible first round pick chance as he plays football for the current day AFL like a Luke Shuey or even a Daniel Kerr," - Sandringham region manager Ryan O'Connor, Inside Football Magazine. "The draft gets some speed with Freeman, who is the quickest player at the top end. He can win his own disposals, tuck the ball under an arm and burst away, and then boot the ball long. He loves to run forward and kick goals, too. Freeman tested exceptionally well at the combine and the Magpies might be keen to add some more speed to their midfield," - Callum Twomey, AFL.com.au, 19 November. "I've been blessed with a bit of pace. I try to exploit it as much as I can because it's something that I do have, but in saying that I don't try to rely on it too much because you need other weapons. I've always been naturally pretty quick, but I've seen it a bit now and it's starting to impact my footy. I'm all attack and go, go, go, but running backwards was a bit lacking, so I tried to get more two-way work going this year," - Nathan Freeman speaks to Sam Landsberger in the Herald Sun on 6 November 2013.